When I left Toronto, I abandoned most of my furniture. I kept the few things that I had strong feelings for (my bed, the kitchen table, an old tea cart from G's grandfolks), but the rest of it got passed on. When we sublet, and when we lived in the apartment, this wasn't a big deal. We didn't need a lot of furniture. But then we bought the house, and all the empty space became a little overwhelming. Of course we can't afford to furnish the entire space with new things (who could? ), but nor would I want to (who would?). I immediately adopted grand schemes involving me trawling antique stores, used furniture shops and yard sales. 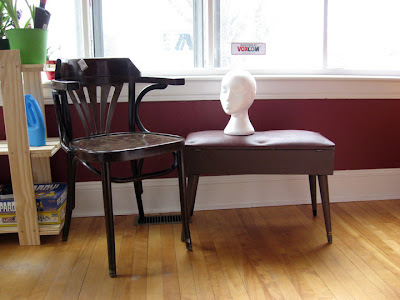 I visualized myself refinishing junky crap into absolute treasures (on the cheap!). Do you realize how early you have to get up to make yard sale visits worthwhile? Do you? I have yet to find out. The antique stores in my neighborhood are a bit more 'high-end' than I was hoping. They have beautiful things, but the refinishing work has already been done, which means the prices are jacked. Shops in my neighborhood have ridiculous hours - they all close at 5:00 pm and aren't open on Sundays or Mondays. COME ON. I do not know how to refinish furniture. I not own any tools. The chair and the bench are destined for the sun room, and the foam head I could not be convinced to pass up (G tried). The chair is in decent shape and feels sunny, plant-filled room appropriate. The bench, however, is fugly. It's hard to tell, but the bench itself is an awful dark brown paint, and the seat an equally-awful burgundy vinyl. It could not be allowed to continue its existence as-is: and so my first refinishing project revealed itself. I should mention that I am not a 'doing' person. I am an 'ideas' person. I began this scheme (and this post) back in June. It's now mid-October (ohmyGodit'smidOctober), and I've only just gotten it finished (sort of). But it IS finished (sort of). It's not perfect, but who was expecting that, really? Have I mentioned that I am not a perfectionist? I decided to use fabric that I already had in the stash, which is fine because I love this fabric. So bright and cheery - and not ugly burgundy vinyl! Don't look too closely at the staples, I implore you. Just notice the fact that the fabric is firmly affixed to the wooden frame. I decided not to put the hinges back in as I would have had to punch holes in the fabric, which would make me sad. In time, you won't be able to see the staples at all. I plan to trim the fabric edges with ribbon or chunky rickrack. Fun! So there you have it. Not perfect, but kinda better. That's how I roll. You've rescued a piece of furniture, and it looks MUCH BETTER, doesn't it?! Good job! I can tell you're a perfectionist by the perfectly straight, finished edges on your fabric. My bench would have edges all jagged and fraying. I love what you did with the bench--I think you should paint the chair white as well--I've been trying to convince Sh and Er to let me paint all the furniture at the cottage in a lovely beachy white...but I know I'll actually have to do it sometime when they're not around!!! Great job and I look forward to seeing more of your projects! Thanks folks! I really am happy with it. See, my original intention was to paint the chair white as well, Sylvia - but G balked (big time). I'm still working on him. I think it would look nice! But I have a desk that needs painting (teal!) that will take priority. i'm sitting in the same type of chair! It's a good chair, Erin! What do you think, leave as-is, or paint it white?